SUMMARY: Lowry Walker escapes to the stars, taking a graduate position on the new International Space Station. Her dissertation includes gathering Landsat data over Antarctica, now exposed after global warming has melted the ice caps, but her mission is to heal herself after divorcing an abusive husband. 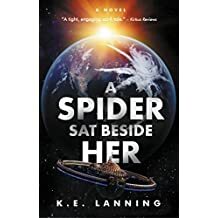 A work of literary science fiction of 75,000 words, A Spider Sat Beside Her is a realistic yet allegorical tale of wounds to the heart, the body, the soul . . . and the Earth. THE BACK STORY: I was interested in human migration and escape, and ultimately dovetailed that with global warming and political corruption. I was fascinated by the political and societal impacts of massive sea level change. I also used the opening of the West as a guide for what might happen if humans found themselves with not enough land, and for possible consequences of settling a new continent. WHY THIS TITLE: A Spider Sat Beside Her came out of the thought of technology spinning a web around us, without us truly being aware of the consequences. It’s also a metaphor for the political web the MC Lowry becomes enmeshed into. WHY SOMEONE WOULD WANT TO READ IT: It’s a thinking person’s read. A young woman snagged in a fight between political corruption and a clash of cultures, all set in a flooded future earth. AUTHOR PROFILE: K.E. Lanning is a scientist and writer. Born in Texas in 1957, she grew up near Houston in the small town of Friendswood, laced with white oyster shell roads and open fields dotted with huge live oaks—riding horses rather than bikes. But nearby, NASA’s space program shepherded thoughts of astrophysics into her head. Lanning received a bachelor’s degree in Physics in 1979 from Stephen F. Austin St. University in Nacogdoches, TX and a MBA in 1986 from the University of Houston. In her geophysics career, science met art—imaging landscapes beneath the surface of the earth. Lanning owned and directed an art gallery in Houston, fascinated with curating thought-provoking shows with new and proven artists. A life-long fan of science fiction, Lanning has always been intrigued by the multi-dimensions of the genre, allowing the author to explore society, humanity, and our future—bringing the reader along for the ride. To reveal the inner workings of some of the best sci-fi authors in the business, she’s published a series of sci-fi author interviews in OMNI magazine, In the Author’s Universe: Sci-Fi Authors from a Writer’s Point of View, including authors Hugh Howey, Margaret Atwood, and Cixin Liu. Her first novel is A Spider Sat Beside Her, a work of literary/speculative science fiction, with an eco-fiction emphasis, and will launch in late summer/early fall, 2017. Two additional novels, The Sting of the Bee and Listen to the Birds, are in the works and will complete the trilogy, though each will be standalone works. AUTHOR COMMENTS: K.E. Lanning–author and scientist–intrigued with the sci-fi genre as a means to explore our humanity and future on Earth. PRICE: eBook $9.99, Paperback list is $12.99, but discounted to $8.66. Lately I have been finding an interest in books about traveling among the stars and galaxies. I will be adding this to my list of ‘want to read’.